Before I get onto another compressor review, I have to write a word or two about reciprocating compressors which make up the bulk of my articles. You see, there are two basic types of reciprocating compressors: single-stage and two-stage. The go-to solution for professionals are usually the two-stage compressors, while single-stage compressors which are able to provide up to 125 PSI are perfect for just about anyone else including enthusiasts, hobbyists and handymen. With single-stage compressors, you have one piston which is used to compress the air and pump it into the tank. The tanks are usually small to medium-sized especially on models designed to be portable, and the power comes from a direct drive electric motor. The Ingersoll Rand P1IU-A9 Hand Carry Twinstack 2-HP Compressor features a twin-stack configuration of two tanks, and powerful motor which is what caught my eye. The device is aimed at enthusiasts who are into remodeling although this unit is a favorite among contractors as well because of its incredible sturdiness and reliability. I may be exaggerating here, but this thing is built like a tank! It has enough power to run two power tools at the same time via two quick disconnect couplers located on the compressor. The P1IU-A9 employs an oil-lubricated pump which is the best option if you want the device to last longer. Other features include the twin four-gallon tanks, 1/4-inch universal couplers, a pressure gauge and a regulator. One of the first things you notice when you look at the compressor is its twin four-gallon tanks which are stacked horizontally. The unit weighs a considerable 77lbs which doesn’t exactly scream portability. To make things worse it doesn’t have any wheels however, it does come with a carrying handle which makes up for it to a certain extent. Personally, I think it would be a good idea to invest in some kind of cart so you can push it around more easily. While it’s not among the most portable of air compressors, this unit is certainly one of the sturdiest you will ever come across. The entire unit is nested in a heavy-duty cage which seems like it could take a direct hit from a bomb and come out the other end without a scratch! The compressor is exceptionally powerful thanks to its 2hp motor, and is able to deliver in a smooth and consistent manner. It is also low on vibrations because it has a balanced crankshaft. The compressor delivers 125 PSI, or 90 PSI at a delivery rate of 4.4 CFM. These figures place the Ingersoll firmly at the top of its class when it comes to performance. If you are looking for a compressor that is able to run continuously without a hitch, I think this unit is well worth considering. Since this machine will be used for heavy-duty work, it has an oil-lubricated pump which is better for longevity, and it requires a minimum amount of maintenance. Just about any contractor will find this air compressor suitable for their work, but it will also feel right at home when given a complex DIY task such as building a deck or roof. Thanks to the generous use of cast iron in its construction, this compressor is impressively robust. I was somewhat surprised to find that despite all the power and heavy-duty design, the device is not as noisy as I thought it would be. Honestly, I was excepting something along the lines of a jet engine but at around 80Db it is actually pretty decent. Granted, compressors are not designed to be quiet but it is still nice to find one that doesn’t make your ear drums bleed! This certainly isn’t one of the cheapest models on the market but it is worth every penny you pay. Before you decide to actually buy one, think about whether or not you actually need it. If you are an enthusiast, this compressor might be a bit too much for you. 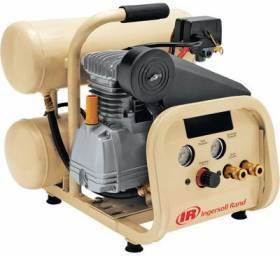 However, those looking to use it professionally can buy without thinking twice because you’ll be getting a high-powered, sturdy and reliable air compressor whose performance is pretty much unrivaled. I know this air compressor has received rave reviews among DIY’ers and professionals alike. Although compact, it packs some contractor-grade power and performance. Its twin tanks allow smooth power delivery, and a cast iron construction makes it as sturdy as a concrete bunker! It is on the heavy side, but trust me once you see how it performs you won’t mind carrying it around. I was also pleasantly surprised it’s not overly noisy, which is always a plus in my book. For those in the market for a reliable air compressor that will do the job perfectly every time, this model is an absolute must have. If you’re interested, you can find one on Amazon where there are often some great deals to be found on price.